For this year's list we focused on smaller places that offered the best combination of economic opportunity, good schools, safe streets, things to do and a real sense of community. 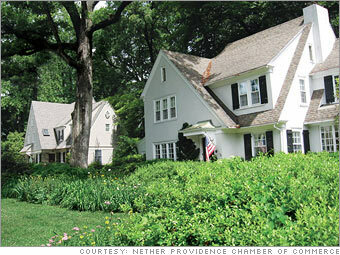 Neighborhoods in Nether Providence are minutes from Philadelphia but feel worlds away. 9. Nether Providence (Wallingford), Pa. Spend a little time in Nether Providence, a.k.a. Wallingford (its largest community), and you'll find yourself forgetting that Philadelphia is 20 minutes away by car or commuter train. A 4.6-square-mile township of lush green hills, old stone houses and expansive parks, Nether Providence also offers good schools, and a nice home can be had for $300,000 or even less. Nether Providence doesn't have its own downtown, but most residents can walk or bike to Media, where there's a movie theater and plenty of locally owned shops and restaurants. If the Philly economy were growing more briskly, Nether Providence would rank even higher. About 30% of the town's workers commute into the city.